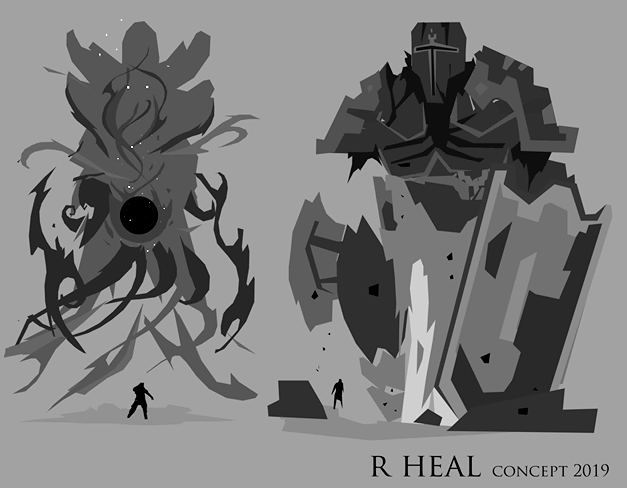 The first feedbacks about Facing the Titan are starting to appear, and I have started the first revisions. The Draft 1, if it correctly set the foundations of the game and the system, required corrections to better explain how it works, to better present the mechanisms. Also, some points needed to be revised. 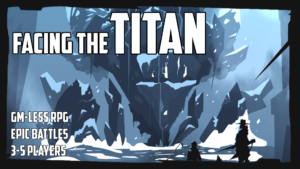 Google Documents of the 1.1 Draft of Facing the Titan. Comments available. Motifs Sheet for Facing the Titan. French prototype. Not many text, usable with english version as well. The Google Docs file is still open for comment, and you are welcome to comment on it. It will continue to evolve. 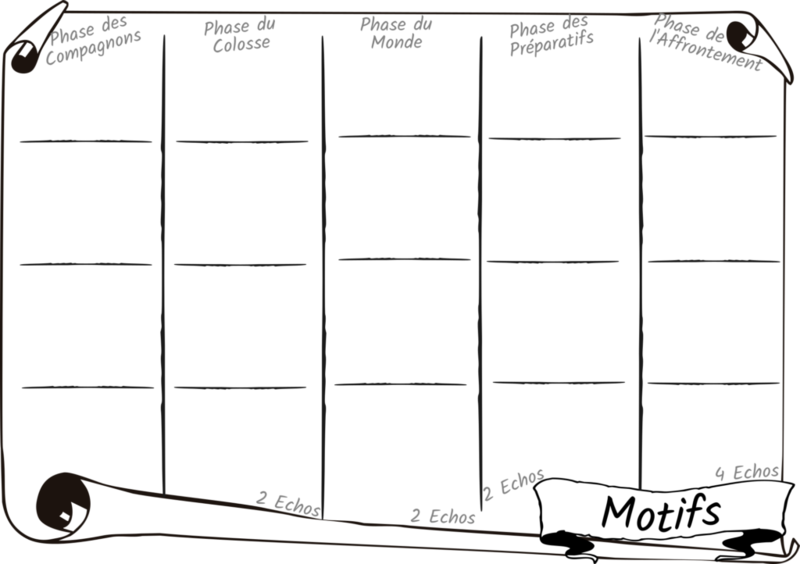 The Motifs Sheet is currently in a still state. Its structure will change very little. But its shape will be adjusted to the final shape of the formatted rules. There have been evolutions between the Draft 1 and this 1.1 version. Slight and minor for the most part. I have moved information and completed the general description of the Motifs and Echoes as well as the Tones and how to use them. No new rules, but a reorganization following feedback of misunderstanding of some elements. This should be clearer, in particular by their position prior to the description of the phases. The first part of the Companions Phase has undergone a profound revision, moving from Introductions to Entrances. Tests led me to change the behaviour of this part. Originally only a dialogue in the style of « Who are you? » « I am what’s-my-name », this sequence didn’t work. It was difficult to apply a Tone to it easily, to present one’ s character, one’ s clothing, one’ s way of acting. There was no reaction from the other characters. The Reunion Site also posed a problem for me. In the first version, it was only revealed once all the Introductions had been made. I decided to make it the first piece of the story. The site is described, then each character enters it. I took up this idea from Death of Legends, where each year the Legends meet in a new place. The Entrances are then scenes where each one presents his Companion and his way of coming and entering this place, where other Companions are waiting for him, and can react to his arrival. It will be more dynamic and lively. In the Companions Phase, the white die represents the Noble Tone. It evokes Control, Stability, Civilization, Order, Tradition. The heiress of a reigning family. The leader of a merchant guild. A citizens’ congress. A formal contract. A lineage dating back to the first Company. A ceremony in a gigantic temple. A phalanx of soldiers. A conspiracy in the shadow of a minaret. The brutal application of the law. Fate set and unalterable. In the Companions Phase, the black die represents the Barbarian Tone. It evokes Anarchy, Nature, Liberty, Chaos, Change. A lonesome nomad. The sarge of a heteroclite mercenary troop. A brawl on a port. The oral transmission of tales and legends. An orphan full of vengeance. A sacrifice in the depths of a jungle. The ride of rhino riders. A howl at full moon. A severed head thrown over the fence. Chains that break. The next step is to work on the Draft again and again. Begin to lay the foundations for the layout, in order to have a clean prototype quickly, and estimate the pagination. And then tests, more tests. Feel free to test it out yourself ! I am also preparing the fundraising campaign, which is not so obvious. But it’s interesting! And Roger Heal started producing some visuals. A beta of the 6 basic Titans, in a way. Here is an overview. If you have any questions, opinions, comments, desires around Facing the Titan, do not hesitate to contact me via a forum, on social networks, here or elsewhere.